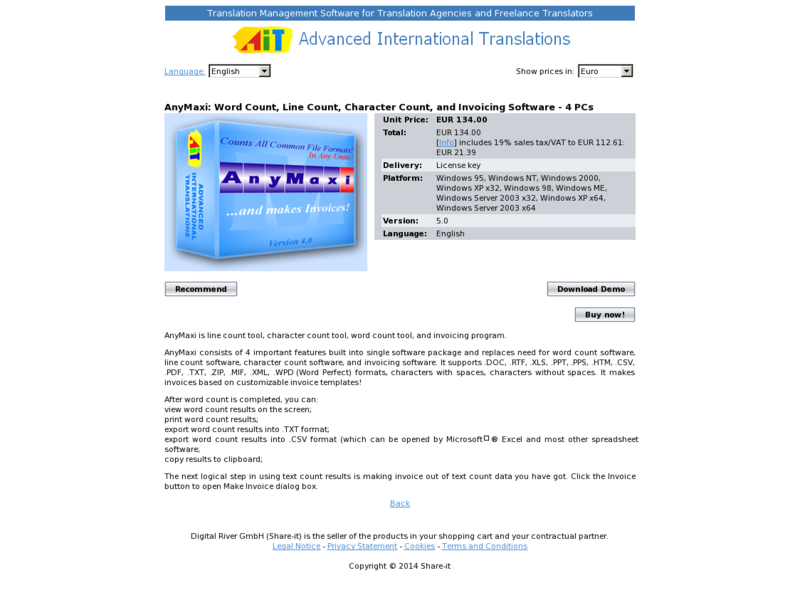 AnyMaxi is line count tool, character count tool, word count tool, and invoicing program. AnyMaxi consists of 4 important features built into single software package and replaces need for word count software, line count software, character count software, and invoicing software. It supports .DOC, .RTF, .XLS, .PPT, .PPS, .HTM, .CSV, .PDF, .TXT, .ZIP, .MIF, .XML, .WPD (Word Perfect) formats, characters with spaces, characters without spaces. It makes invoices based on customizable invoice templates! The next logical step in using text count results is making invoice out of text count data you have got. Click the Invoice button to open Make Invoice dialog box.